Your website is all well optimized. You’ve invested a lot of money in top-notch photography, product copywriting and other areas of your website, but still the conversion rate is still not satisfactory. Probably your users are finding it difficult to figure out what action to take once they have decided to purchase a product. In such cases, the problem is largely due to unclear call to action. A call to action, as the name suggests, directs the user regarding the next action to be taken. CTA buttons guide the user in their buyer’s journey from becoming a visitor to a paying customer. In this article, we will look at 10 examples of effective call-to-action, understand why they work and see how you can implement them on your website. Let’s start with arguably the simplest CTA – the one on the product page. Amazon places its Add to Cart on the extreme right end of the product page. The mustard color of the CTA button makes it stand out on the page from other elements. Although not a CTA, another contributing factor in helping people make a decision is the #1 Best Seller tag next to the product. Talking about product page CTAs, here is how Flipkart places its CTAs. You can notice that there are 2 CTAs, viz. : Buy Now and Add to Cart. Also Buy Now is prominently highlighted as it gets the first precedence than Add to Cart. Another thing worth noticing is the use of scarcity. Scarcity works in e-commerce because it creates a sense of urgency. It makes people act swiftly. Flipkart takes advantage of it by mentioning about it on the product page. H&M takes advantage of placing a banner on their homepage in the above the fold area. So, when a user lands on the website, the first thing they’ll notice is this banner CTA. The banner creates urgency by stating Get it before it’s too late followed by mentioning the sale details. Users can get to view the sale items by clicking on the respective CTAs based on their age or gender preferences. What is better than one banner CTA? Myntra highlights all their major discounts and offers on these 4 banner CTA buttons. These CTAs work because they are well designed, they stand out on the page, and they are simply eye-catching. Placed just below the fold, when you scroll for the first time, you will notice them and will be tempted to click to check out the offers. Similar to H&M, Sweetwater also places their main offers on the homepage, but instead of using a banner, they utilize their main hero image section. In the left section of the image, you can see Sweetwater promoting January clearance sale followed by the Shop Now CTA, and on the right hand, you can see the brand promoting another offer followed by the same Shop Now CTA. Since the brand uses strikingly different colors for both banners, both offers stand out on the page. Although it is unconventional to promote two offers next to each other, it works in this case as the audience for both offers is mainly different. Social proof plays a crucial role in shaping the shopper’s purchasing decision. Reviews and ratings help determine shoppers whether or not to buy a product. Positive social proof is proven to increase product sales. Ustraa utilizes reviews on its website homepage by posting them with clickable links to its respective product page as shown in the image above. Since Ustraa is known to verify each and every review, you can trust the credibility of the reviews. WWE Shop does a great job at showcasing discounts and top-selling products in the header section. Each offer has a CTA placed next to it, which is easily recognizable. Notably, in their semi-clearance sale slide, they highlight a promo code along with the 3 tiered discount offers which are clearly visible. Except for the first slide, the CTA button is kept the same making it easily distinguishable. Xiaomi uses the most potent place on the homepage to advertise their newest product. The brand uses the homepage slider as a nifty product page. Xiaomi displays product name, features, prices along with the product price at the bottom of the slider. As it is showcased at a prominent place, it is guaranteed to receive a higher click-through rate. Now, pop-ups can come across as one of those annoying growth hacks, but when implemented thoughtfully, they can bring you the right results. One of the right ways of using pop-ups is using exit-intent pop-ups or right when a user lands on your website. New York Times initiates the pop-up as soon as a visitor lands on their website. 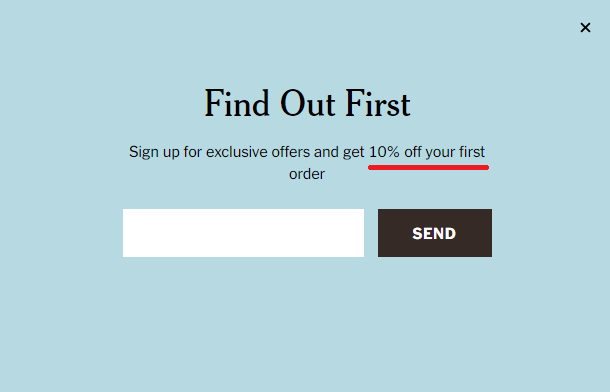 This tactic is effective because they are asking for the user’s email address and in return giving away a 10% discount on their first order. Now, serious buyers won’t mind doing this as during checkout; they have to sign-up with their email address anyway. Baron Fig introduces their affiliate program in the header section of their website. The text Give $10, Get $10 builds anticipation and incites people to click on it. The CTA works because it is placed above the fold, clearly visible and most importantly incentivizes users for their actions. The call to action is an important element on the website as it directs the user towards the necessary action. Hope these 10 examples have given you some inspiration to try out something different. One of the simplest ways to design CTA is to remember the ABC of sales. I.e. Always Be Closing. Also keep testing different variations in terms of the CTA copy, button color, size, etc. to see what works best. Which among these is your favorite CTA? Please let us know in the comments below!